Present cover of book to each student. (There is a picture, but no title on cover page). Flip through the book and do a “Book Walk” by looking at the pictures briefly. Three (3) MAIN WH?s to think about and answer throughout and after reading the book. Write these on the Dry Erase Board for visual cues. Start reading book- answer wh?s throughout. 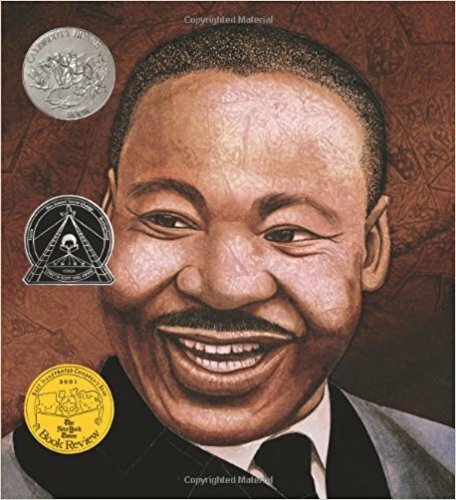 For student(s) working on vocalic “AR”- have student say “Martin” each time the word comes up in the book by pointing to student. Use pirate sound “AR” and hand models to show placement cues for back of tongue elevation. Sequence the five (5) main events in the story. Create a main idea for the book. Ask inferencing questions about pictures and text. Go over figurative language that is in the book. Question- How would YOU feel if you were Martin? (Draw/Art activity). Can use Boardmaker pictures with field of 4 picture choices. For Preschool- talk about colors and shapes in the pictures. Discuss unfamiliar vocabulary concepts with the students. Extend to talking about months of the year. Make copies (color if possible) of important pictures and sequence story. Discuss the themes/visual concepts in the book-flags, stained glass, art and why the author chose them. Write and perform a skit based on the story. Talk about about family and who can make up a family. Langevin, M. & Prasad, N. G. N. (2012). A Stuttering Education and Bullying Awareness and Prevention Resource: A Feasibility Study. Lang Speech Hear Serv Sch, 43(3), 344-358. doi: 10.1044/0161-1461(2012/11-0031). This article speaks primarily about peer attitude towards children who stutter and toward bullying within the school setting. It proposes the idea of using a curriculum level stuttering education program to promote positive opinions towards CWS. To measure the progress, a pretest-posttest study design was used. The article goes on to define bullying as a type of aggressive behavior with an imbalance of power with an intent to harm. The researchers broke down the roles of bullying into 4 main groups: perpetrators of bullying, victims of bullying, dually involved children, and uninvolved children. All 4 main groups were targeted in the study and completed the education program and pretest-posttest. Multiple pretest-posttests were used including the Peer Attitudes Toward Children Who Stutter Scale (PATCS), The Provictim scale, and bullying involvement and knowledge questionnaires. The PATCS is comprised of 36 items that are categorized into 3 subscales: positive social distance, social pressure, and verbal interaction. Overall higher scores reflect more positive attitudes. The Provictim scale was used to quantify children’s attitudes toward bullying. The 3 subscales measure approval of bullying, rejection of weak kids, and support for victims. Again, higher scores represented more positive attitudes. The questionnaires comprised of questions assessing participant role status, changes in knowledge, and student perceptions of the curriculum based program. Questions were answered using a 5-point Likert scale. In regards to the curriculum based stuttering education program used, the authors developed their own as they saw a significant need for more universal interventions that target the student population. With this need, they developed the Teasing and Bullying: Unacceptable Behavior Program (TAB). The TAB is intended to increase people’s knowledge about bullying and stuttering, improve attitudes toward CWS, reduce approval of bullying, improve support for children who are bullied, and mobilize the peer group to support CWS. The population that TAB was intended for was grades 3 to 6 as evidence suggest children in younger grades were unable to label disfluent speech as stuttering. It should be stated that the TAB was designed to be given by both teachers and SLP’s; however, for the feasibility of this study, the TAB was only given by teachers. The TAB contains 6 teaching units with each unit comprising of in-class discussion guides, potential responses from children, reproducible activities, and take-home parent-child activities. The Tab also has a video that goes along with eat unit. As mentioned above only students grades 3 through 6 were used. A total of 608 students were used. Schools used were in socioeconomically advantaged and disadvantaged urban and rural areas. Results of the study were aimed at answering 3 questions. The questions were as follows 1. Was there significant differences in pretest and posttest PACTS and Provictim scores between the group of participants as a whole 2. Was there significant differences in knowledge about how to respond to bullying and 3. Did the participants like the TAB program? Results indicated that overall there was a statistically significant increase in the test scores as whole group as well as a statically significant increase in knowledge about how to respond to bullying. Lastly results revealed majority of the students, 65.7 %, like the TAB. Overall results suggest the TAB program has the possibility to improve attitudes towards CWS. article only used teachers to deliver the TAB, the authors stated SLP’s can deliver it as well. However, it should be noted that the TAB takes 4 hours to deliver completely; consequently, I am unsure of the feasibility of completing the whole unit. Perhaps SLP’s can use parts of it and deliver it to multiple classrooms. The authors begin by citing research about voluntary stuttering (also referred to as negative practice, pseudostuttering, and bouncing), noting that it is thought to be used as a technique to reduce fear and anxiety about stuttering and to decrease feelings of loss of control. 2) voluntary stuttering that is focused on easy, effortless bouncing or sliding of sounds regardless of types of dysfluencies the client produces. 2) does the use of voluntary stuttering outside of the clinical setting addto the impact of treatment? The authors set out to answer these questions by asking participants (adults over the age of 18 who stutter) to complete a survey answering 45 questions about their own types of stuttering, the therapy they have participated in and their attitudes about voluntary stuttering. The results of this survey found that greater reduction in fear was reported for those who said that their voluntary stuttering imitated their real stutters. Those who reported that the use of voluntary stuttering had no effect on their fear of stuttering were more likely to report that their voluntary stuttering did not imitate their real stutter. Along those same lines those who reported voluntary stuttering sounded like their real stutters were more likely to report being more confident in using the voluntary stuttering than those whose voluntary stuttering did not sound like their real stutters. In addition, those who reported that the use of voluntary stuttering had reduced their fear of stuttering were significantly more likely to respond that they had used voluntary stuttering outside of therapy than those who responded that they never used voluntary stuttering outside of therapy. The authors conclude that the results from this survey suggest that the perceived benefits of voluntary stuttering are associated with the type of voluntary stuttering produced and whether it is used outside the clinical environment. They extrapolate that these feelings of fear and worry about use of technique are significantly reduced upon initial use and therefore therapists should explain to the client that they must use this technique with increased frequency, especially outside of the clinical setting, in order to experience the benefits of the technique. They also conclude that clinicians should be aware that having a client imitate his or her own type of stuttering may be perceived as more beneficial to the client. While I think this study helps answer some questions about how clients feel about voluntary stuttering, I am also am aware of the differences in working with children rather than adults. Specifically, children may not have the self-awareness to determine which types of fluency building techniques are most beneficial to reduce their anxiety. I do think we can take away some general lessons, one of which is that we must talk to our students about how they feel about their own stuttering in addition to teaching them techniques. Also an important take away for me is to look for opportunities where I can assist my student in using fluency building strategies outside of our sessions. This article makes me want to increase my efforts to push into the classroom to help my fluency students feel comfortable generalizing strategies we have practiced. Also, I will take a more careful look into how the strategies I teach match each individual’s type of stuttering behaviors. This summer I attended a course during the SLP summit. For those of you who are not familiar with SLP summit, it is a virtual convention of sorts. They offer a variety of classes that you can attend live online or watch afterward. You can use these for CEUs for your license! Best of all it is *FREE*. I believe they will be offering another one this Winter so if you need CEU hours check it out! I attended a course entitled “ Mistakes in Data Collection” Melissa asked me to share what I learned so, here we go….. The first thing they address was that we need to take data! When doing good therapy this can be difficult. But, without it we cannot assess effectiveness of our treatment. They suggest 50 responses per session. I think for artic it is certainly possible but probably not for most language tasks! It was suggested that when you take data to take it quickly at the beginning of the session. It is hard to take data during the actual therapy time when you are teaching , and managing the group. So, now that you have taken data, actually look at it and see what it means. They remind us to not only pay attention to percentages towards progress with goals but also the type and amount of cueing we use to achieve that percentage. I usually try to include the activity that we did in therapy. When I look back I can see if they did better with a book, computer activity etc. These presenters stressed to “ avoid the mega goal”. We all want to keep our number of benchmarks manageable but when we put too many concepts into one goal, it is impossible to take data! If we are taking data on several sounds or concepts our data can be skewed. Make sure that however you take data that it works for you. If you come up with a system that is compatible with your style you are actually more likely to take the needed data. One other point that was mentioned is using criterion referenced test as part of data collection. Just as a refresher, “Criterion-referenced tests and assessments are designed to measure student performance against a fixed set of predetermined criteria or learning standards—i.e., concise, written descriptions of what students are expected to know and be able to do at a specific stage of their education.” You would get a baseline score and then have them take it again at a later point to measure their progress. I am not familiar with any personally. But, I think they could be a great tool for older students ( my caseload is preschool) and a good way to show progress to parents and teachers. SLP summit is a great way to earn some extra hours for CEU credit , check it out if you need hours! This was an insightful article. I know I will consider what the authors found in this study in future assessments and even during current therapy sessions. To begin, the authors note that previous research illustrates that children who stutter typically do so more during conversational tasks than other communicative tasks (i.e. narration). However, this research has analyzed the fluency of preschool aged children. The article I read, Speech Disfluency in School-Age Children’s Conversational and Narrative Discourse, makes comparisons among school-aged children. The authors compared speech samples of children who stutter (CWS) and children who do not stutter (CWNS) by comparing structured conversation and narration. The participants were divided into groups based on age (younger 6:0-7:7 and older 8:0-10:5) and diagnosis of a fluency disorder (CWS and CWNS). All of the participants demonstrated typical development of articulation, language and voice skills. The authors used an experimental version of the TOCS to elicit structured conversational speech samples and narrative speech samples. The structured conversational task was completed first, and participants were given open-ended commands and open-ended questions. The participants then completed the narrative task, formulating a story using the same picture scenes from the conversational task. The examiners provided explicit directions to tell a story and did not engage in any communicative exchange during the narration. The authors analyzed the types disfluencies produced by all groups of participants into 2 broad categories: stuttering-like disfluencies (monosyllabic word repetitions, audible sound prolongations, blocks, sound or syllable repetitions) and non-stuttering like disfluencies (typical- phrase repetitions, revisions and interjections). Each word of the samples was analyzed for the disfluency type and frequency. The authors further determined the percentage of disfluencies in the each sample, percentage of stuttering-like disfluencies per word and percentage of non-stuttering like disfluencies per word. The authors determined that significantly more types of stuttering-like disfluencies occurred in the narrative task than the conversational tasks in the CWS groups (age did not matter). As predicted, the CWS groups produced more stuttering-like disfluencies than the CWNS groups in both types of discourse. There were no significant differences found between the ages of the groups or the frequency of disfluencies between conversation and narration. When comparing non-stuttering like disfluencies, there were no significant differences found in types of disfluencies between conversation and narration or the frequency of non-stuttering like disfluencies. The authors noted that CWS groups and CWNS groups produced similar amounts of non-stuttering like disfluencies in both types of discourse. However, the younger group in this study produced significantly more typical disfluencies during the conversational tasks than the narrative task and there was not a significant difference found in the older group. What I take from this article is that: 1) our assessment procedures should include both types of discourse- conversation and narration; 2) consider the age of the child (preschool or school-aged) when selecting tasks to obtain speech samples, ensuring that we are utilizing types of discourse that will provide an opportunity to observe true stuttering behaviors. I plan on applying this in treatment sessions as well, creating speaking situations that utilize a type of discourse where students are more likely to produce stuttering like disfluencies. This will allow for more opportunities for the students to practice their strategies and modification techniques, while also informally targeting language skills. This can also help in planning and creating activities to address multiple goals in mixed therapy groups; 3) carefully consider the types of disfluencies. While reading the article, I kept thinking about the Fluency professional development taught by Dr. Lonnie Harris. I remember him discussing the types of disfluencies and how certain ones (what the authors call stuttering-like disfluencies- monosyllabic word repetitions, audible sound prolongations, blocks, sound or syllable repetitions) are a red-flag when evaluating the fluency of a younger child to determine if the child actually has a fluency disorder or if the child is demonstrating developmental stuttering. This research article illustrated that types of non-stuttering like disfluencies and frequency of non-stuttering like disfluencies were about the same among the CWS and CWNS groups. This is important to remember as we are evaluating the fluency of a student. The purpose of this article was to study secondary school teachers’ beliefs, attitudes and reactions to stuttering within their classroom setting due to the fact that teachers, as well as speech-language pathologists, indicated the need for more knowledge and training in the area of fluency. The authors achieved this by completing semi-structured interviews with 10 teachers of adolescents who stutter in Belgium. Each head teacher or teaching assistant had a student who stutters in his or her classroom. Results were broken down into two sections: the teachers’ beliefs and attitudes toward stuttering and their reactions to stuttering in the classroom. During the interviews, a majority of the participants stated that they do not know much about stuttering in general. They defined stuttering in terms of the associated behaviors (repetitions, stumbling over words, etc), rather than as a neurological disorder. They also noted that most of their knowledge about stuttering came from internet searches, movies, and TV shows. In regards to their teaching, the participants mentioned that students who stutter could potentially disrupt their lessons by slowing down the lesson or making it harder for peers to understand a presentation made by the student who stuttered. One belief that the majority of participants agreed upon was the fact that focusing on the stuttering could create a problem. According to the teachers, focusing on the stuttering could lead to labeling or extra emphasis added to the disorder, which could cause more distress for the student. In my opinion, this is a belief shared by most people that encounter someone who stutters, regardless of their relationship to the person. I even see this reaction toward stuttering in my school building. For example, teachers and parents would rather pay less attention to the stuttering than have an open discussion about it, particularly if the student or child is young or does not react negatively to the stuttering. One positive fact that surfaced during the interview was regarding reactions of peers. Multiple participants were surprised to see how patient peers were toward their classmates who stuttered. The teachers expected for peers to laugh or make negative comments, but learned that adolescents were very accepting of fluency disorders within the school setting. This part made me smile because I experience this with my middle school students! From my experience, it is so easy to make assumptions and generalizations about middle and high school students being disrespectful and hurtful toward other students. But when you take the time to build relationships with the students and really get to know them, they will surprise you and be more accepting of others than you would ever believe! about the subject. When teachers feel comfortable discussing stuttering with their students and other peers in the classroom, each student learns and may become more open and accepting of the disorder. Lastly, the participants disagreed on how to react to the stuttering of a student during a lesson. Some teachers believed in giving the student extended time to respond, while others believed in finishing the words or thought for the stuttering student. Again, SLPs can play a large role in educating teachers and other school staff on this subject. Overall, this study gathered qualitative data to gain understanding into teachers’ beliefs and attitudes about working with students who stutter. The results concluded that teachers working in secondary education feel confident in dealing with stuttering students; however, their beliefs and reactions may be based on previously learned assumptions about stuttering. More knowledge is needed in this area for teachers to become more comfortable not only dealing with stuttering in their classrooms, but also in supporting their students educational and emotional needs in regards to their fluency disorder. We are given a wonderful platform to share our knowledge and be the bridge between teachers and their students who stutter. This is such a fun activity. My students LOVE it. I saw a blurb about it in the ASHA Leader at some point last year. It is easy to adapt to almost any lesson, for both articulation and language. Just write a target word on the bottom of each cup. The students ‘earn’ a cup….one at a time; at the end of the lesson they can build with them. I keep their ‘earned’ stack near me and then give them the stack all at once when it is time to build. This way, they don’t fiddle with the cups during the lesson.